I wish to thank you so much for the speed in which you saw me... I am very grateful for this. 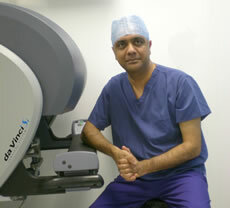 Robotic hysterectomy is one of the commonest gynaecological operations carried out using the da Vinci robot. There are various benefits when the hysterectomy is carried out in this manner with the main ones from the patient's perspective is the reduced pain and the significantly faster overall recovery which can occasionally be down to 2 to 3 weeks instead of the 6 to 8 weeks! You can read more about the benefits of robotic surgery here. 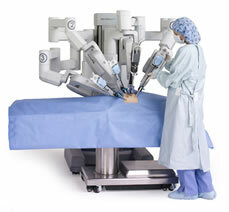 Robotic surgery is otherwise also known as da Vinci surgery. The most popular robotic kit used to perform the surgery is called the da Vinci Robot made by an American company called Intuitive Surgical. Robotic surgery has grown enormously in popularity in the USA and has subsequently also been taken up widely on the European continent. In the UK, uptake has been slow and one of the main reasons for this is the enormous cost of acquiring the da Vinci Robot. You can read more about the costs of a robotic programme here. Robotic surgery has applications in various fields including, general surgery, cardiothoracic surgery, gastro-intestinal surgery, gynaecology, urology, and paediatric surgery. Its use in gynaecology is one of the fastest growing fields where it can be applied in both benign gynaecology and gynaecological oncology procedures. Robotic surgery can be used to treat fibroids, abnormal periods, endometriosis, ovarian tumours, utero-vaginal prolapse and gynaecological cancers such as those of the uterus and cervix. Copyright © 2019 Robotic Hysterectomy. All Rights Reserved.